Looking for some clever ways to express your love this Valentine's Day? It falls on a Sunday this year so perfect for messages left around the house. 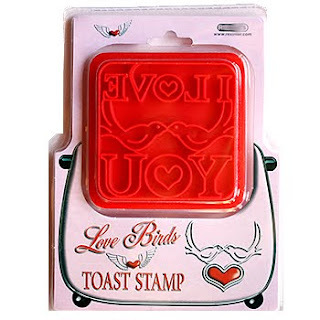 How about a stamped message on your toast? This would be great for breakfast in bed!! What about a coupon book - check out MOO for a twist on making them yourself. Check out premade mini cards - 100 for $19.99. or upload your own pictures and messages. 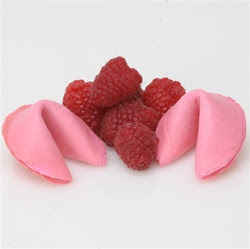 or personalized and individually wrapped fortune cookies from Fancy Fortune Cookies - Choose a variety of flavors. 50 min - $.65 each. 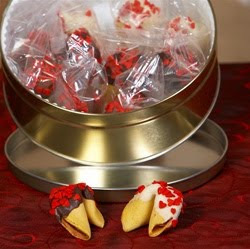 or a whole tin of cookies with loves message inside- also from Fancy Fortune Cookies. Not a fan of all that food coloring in those fortune cookies. I like mine from this chocolate covered fortune cookie factory.